Matterhorn Glacier Paradise (Klein Matterhorn) is the highest ski lift station in Europe at 3,883 m. The Glacier Grotto is located right beside the tram station at the top. The longest ski run is 13 km which takes you all the way back to Zermatt. Ski into the Mount Cervinia bowl and you are actually in Italy. 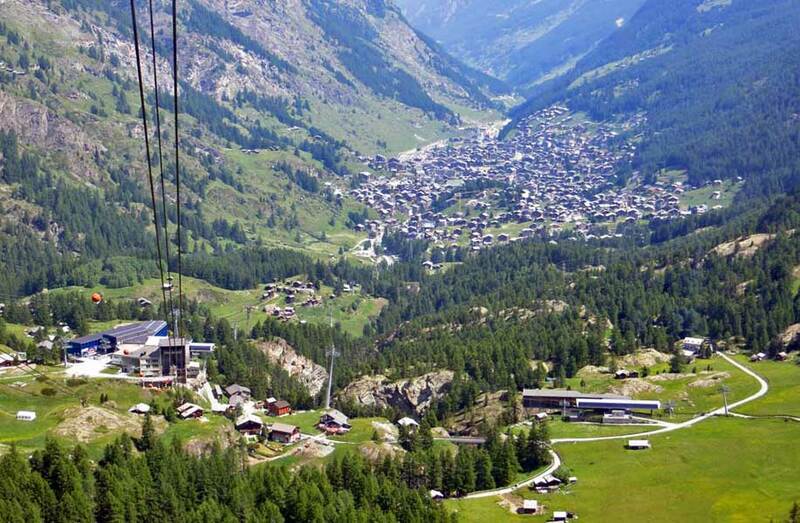 To start your trip, you can walk from the Zermatt train station to the first cable car at Furi. Or take the yellow-green electric bus. The next cable car takes you to Trockener Steg, which has a restaurant. 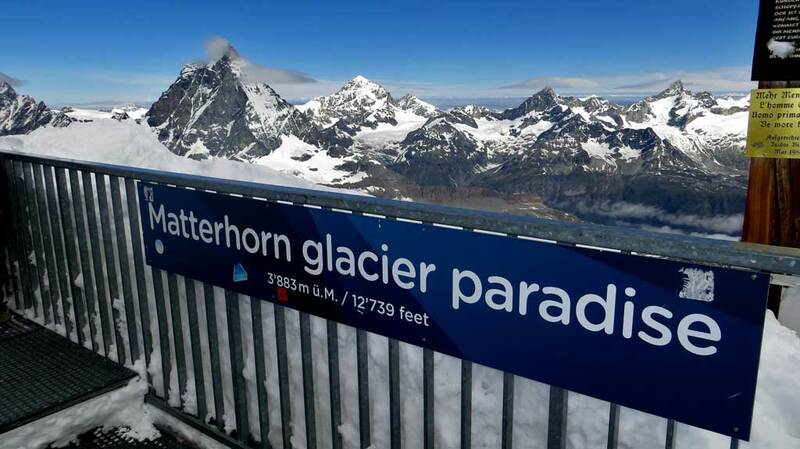 The final cable car takes you to the Glacier Paradise, which is on the small or Klein Matterhorn. 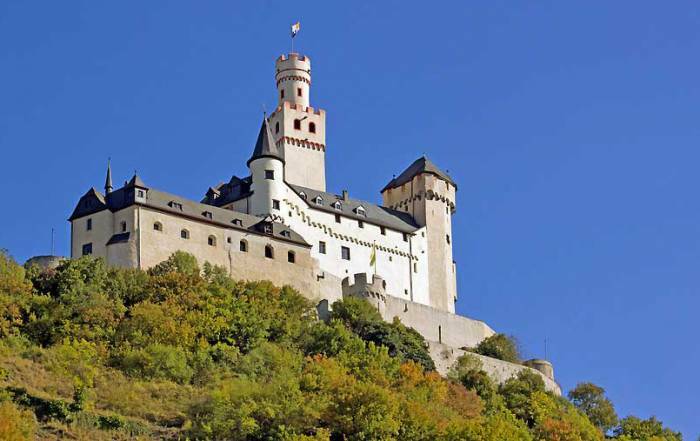 A Swiss Travel Card will save you about 40% on the fare up the mountain. The Gornergrat cog train takes passengers 9 km from the terminal beside the train station in Zermatt to 3,089 m in Gornergrat. It inches you closer to the Matterhorn one clog at a time. The Gorner Glacier is between Gornergrat and Klein Matterhorn. The Gornergrat Bahn has 3 stations on the way up where you can stop and hike. The cog train runs about every half hour in the height of the summer tourist season. 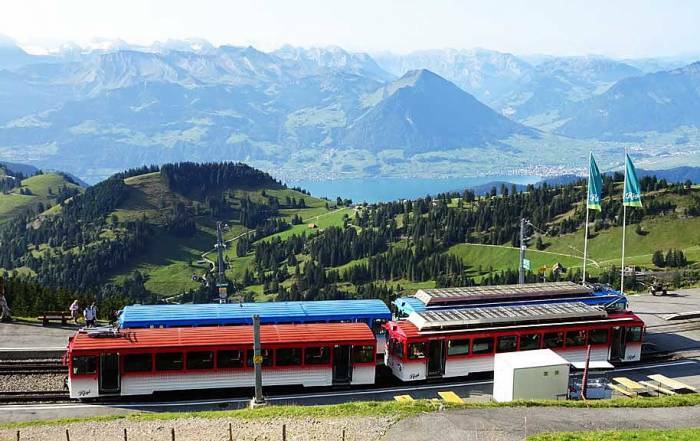 A Swiss Travel Card will save you about 50% on the fare up the mountain. Take the underground Zermatt–Sunnegga Funicular from its start near the Zermatt train station. 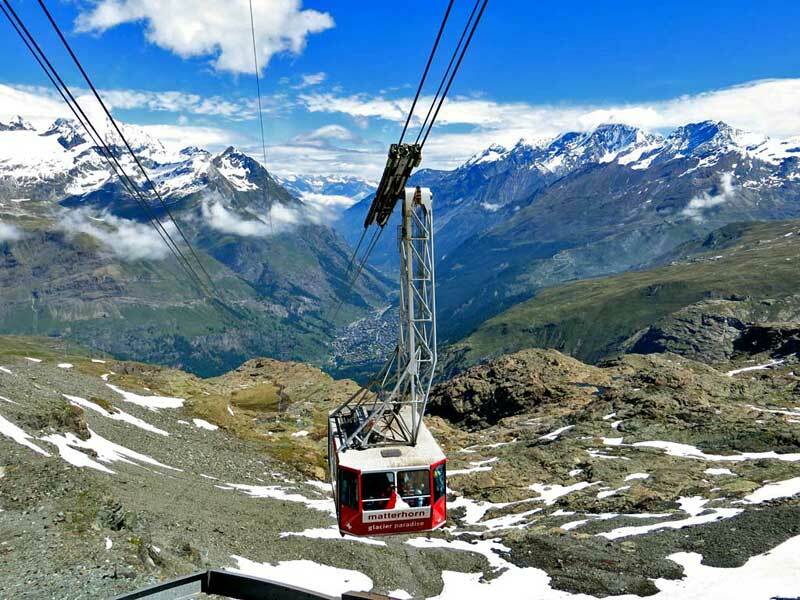 In winter you can then take a number of gondolas and chairlifts into the Rothorn Paradise. 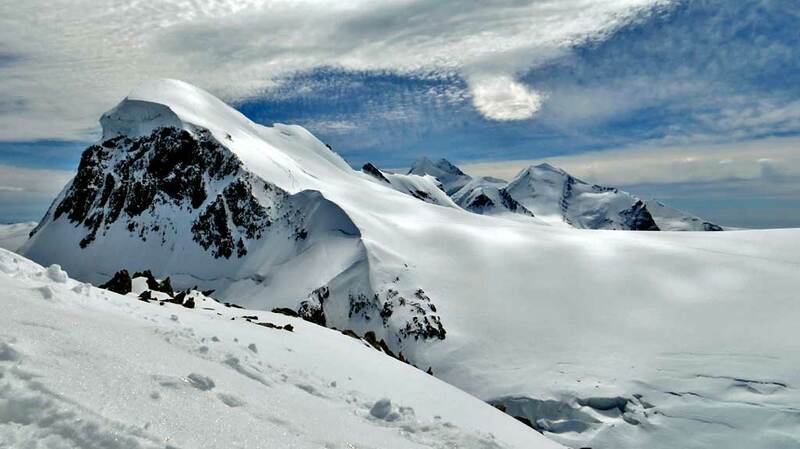 The Findel Glacier is between Rothorn and Gornergrat. Along the way toward Rimpfischorn peak you will find the Fluhalp Hotel and Restaurant. If you head toward Findeln you will find the Chez Vrony for a great Swiss lunch time meal. 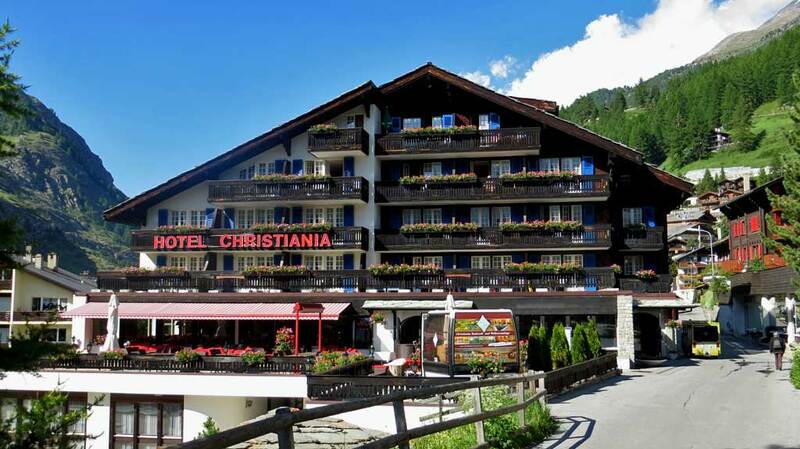 Christiania Hotels and Spa – has spacious suites with a fabulous Matterhorn view. Chrisiania Hotels provides their own electric shuttle service to the train station. An amazing breakfast is included and the restaurant provides views of the mountain while you dine. Kulmhotel Gornergrat – highest elevation accommodation in the Alps; in Gornergrat at 3,089m. 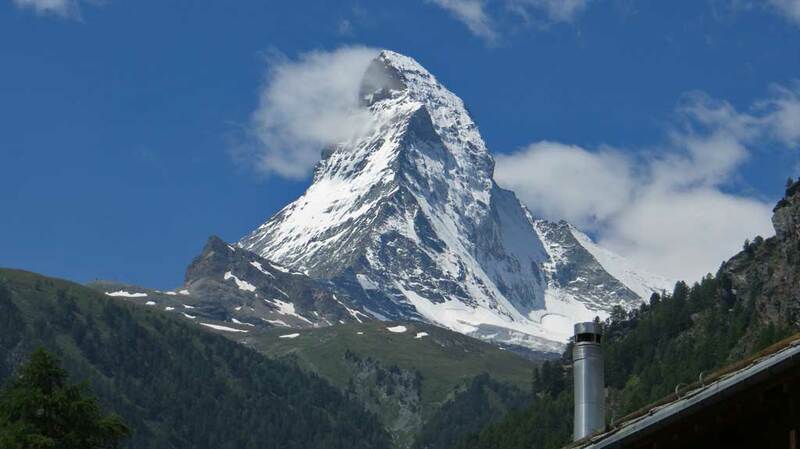 Hotels in Täsch are much less expensive, but you must take a short train ride to Zermatt. Also consider staying in Visp or Brig. Mountaineers’ Cemetery at St Peter’s (the English Church) and St Mauritius (the Catholic Church). View the Matterhorn from downtown Zermatt on several of its bridges as your wander this pedestrian only Swiss village town site. Zermatt Festival – in early September each year enjoy a variety of music performances at the Riffelalp Chapel on the mountain side. Access is by train from Zermatt. Take a helicopter ride around the Matterhorn. Ride the Glacier Express from Zermatt to St Moritz. The trip takes over 7 hours and has 291 bridges and 91 tunnels. This is the world’s slowest express train. The Oberalp Pass is east of Zermatt. The Rhine Gorge is east of Zermatt as the train approaches Chur. The Landwasser Viaduct is located between St Moritz and Chur. 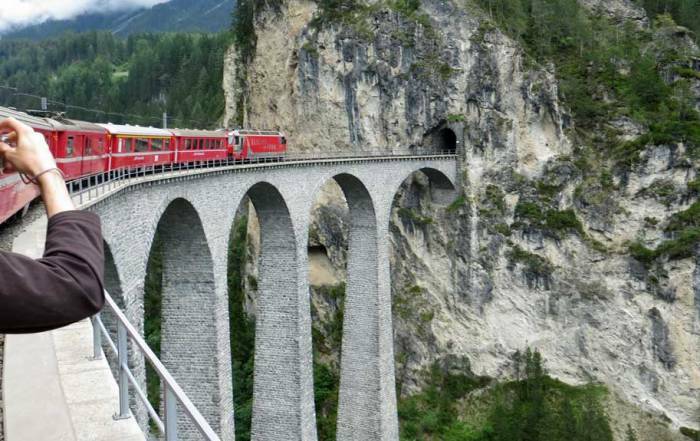 Check out the Switzerland Train Trip for more information. 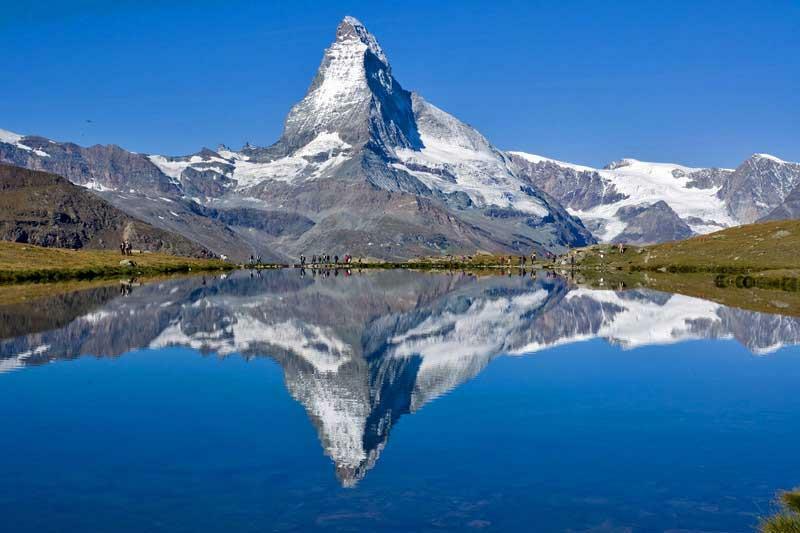 Zermatt Skiing is consistently rated one of the world’s top 3 ski destinations and many rate it #1. 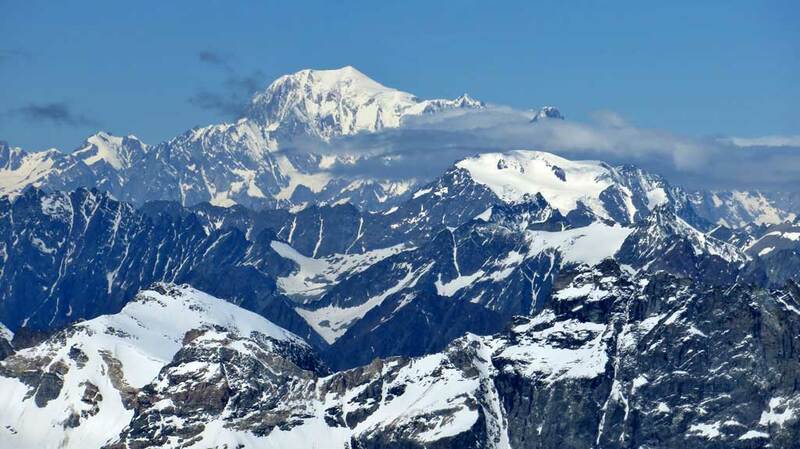 Enjoy Moonlight Paradise night on Rothorn, Gornergrat or Klein Matterhorn. In winter, take a sunset cable ride to one of these ski centers for Swiss dining, including fondue. Then ski down the slopes under the moonlight. Lifts and cable cars interconnect ski areas to provide Zermatt with over 300 km of trails and 69 lifts. Have lunch at Chez Vrony in the Rothorn Paradise. Enjoy a cured meat buffet breakfast at most hotels. Lunch on rye bread (roggenbrot), nut loaf (nusstorte ), fondue and chocolate. 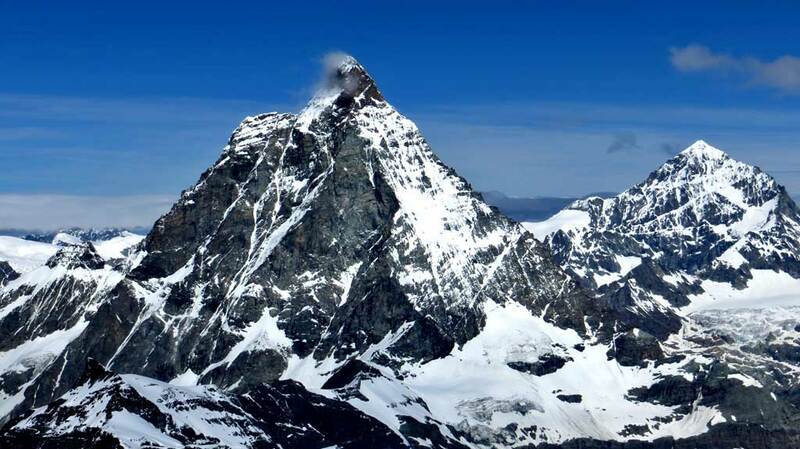 The Matterhorn is the logo for Toblerone Chocolate. Zermatt is known for its skiing and that means wintery weather. You can expect December to January average highs on the valley floor to be around 36 F (2 C). The average low temperature in winter is about 25 F (-4 C). Zermatt isn’t all about skiing though. 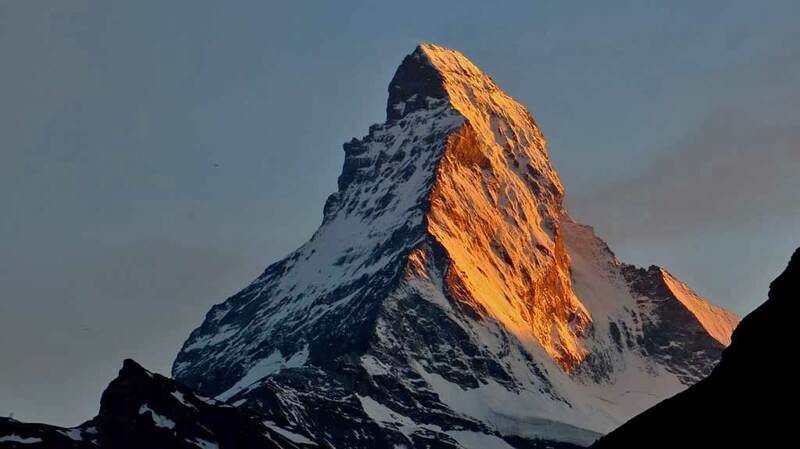 Over 3,000 climbers reach the summit of the Matterhorn each summer. Expect July and August average highs of 68 F (20 F) and lows of 50 F (10 C). There is no pronounced season for rain or snowfall in Zermatt. With elevations up to 12,000 feet, summer temperatures in the mountains are never much more than comfortable or cool. 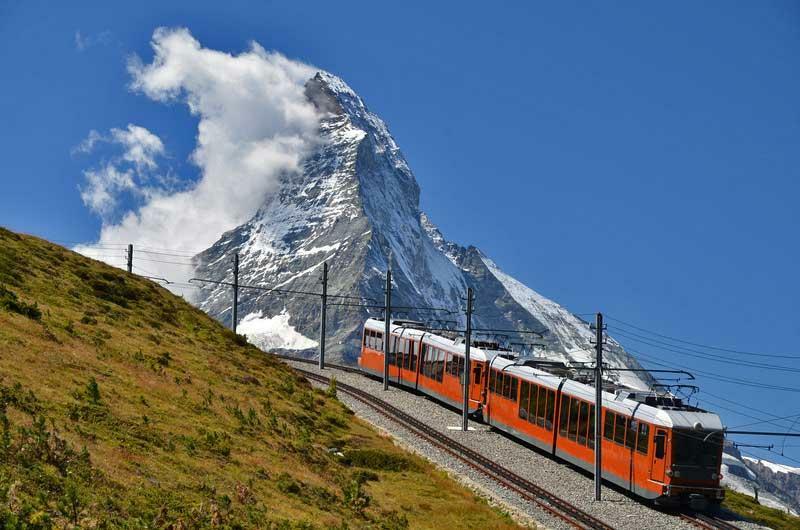 You can get to Zermatt can be reached by train by heading south from Visp via the narrow-gauge Matterhorn Gotthard Railway. 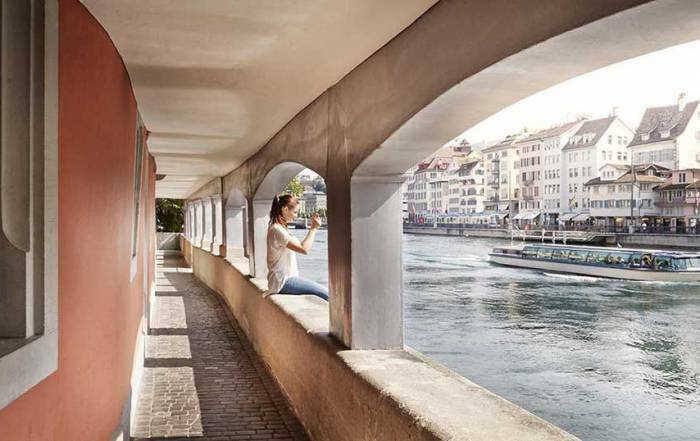 Travel times are: Zurich – 3 hours, Basel – 3 hours, Bern – 2 hours. You can also get to Zermatt on the Glacier Express from Chur and St Moritz, but it will also go through Visp. Motor vehicles have been banned from Zermatt for decades, so local transportation is by battery powered taxi, electric shuttle buses or horse drawn carts. Cars must stop in Täsch on the route south from Visp. There are thousands of parking spots in Täsch where you can leave your car and catch the train to visit Zermatt. Zermatt isn’t as easily accessible as other areas of Europe, but the popularity of the Matterhorn still brings tens of thousands of tourists to this small Swiss village. 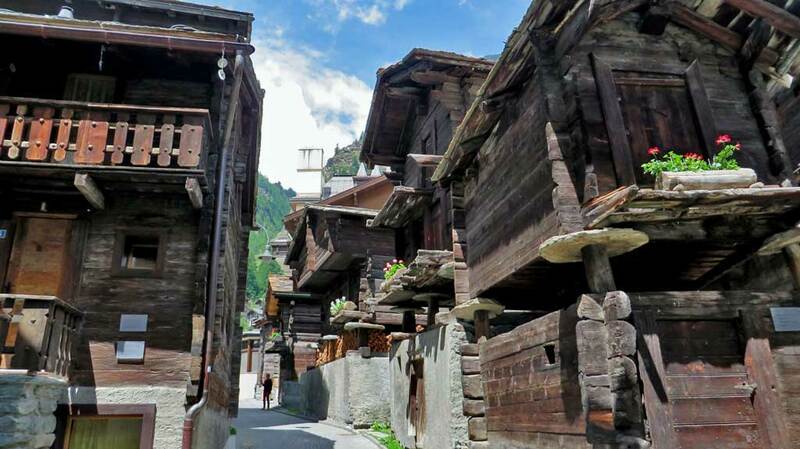 About 6,000 people live in Zermatt on a year round basis. Only locals can buy real estate here. The economy is driven by tourism and there are numerous lodging options. The Swiss village of Zermatt is a blend of traditional rural Switzerland and modern jet setters. 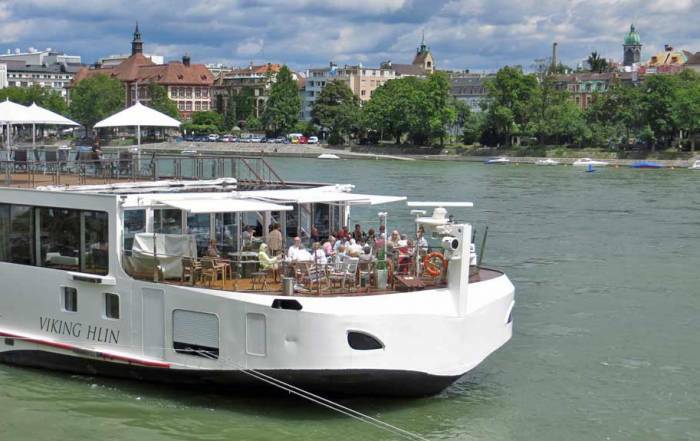 This is the most expensive accommodation in Switzerland, which is itself one of the most expensive countries in Europe.